My research on the history of slavery began in the early 1990s when I read two books by women authors: A Diary from Dixie by Mary Boykin Chesnut and Incidents in the Life of a Slave Girl by Harriet Jacobs. I recommend that you obtain copies of these books for the shelves of your library but if you are a modern reader, you will find each of these titles is hyperlinked to free online versions. "I do not write often now, not for want of something to say but from loathing of all I see and hear." Mrs. Jacobs had the graphic view of those that are forced to endure the crushing weight of the elephant in the ante-bellum period. 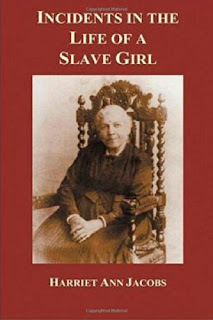 Incidents in the Life of a Slave Girl was published in 1861 and begins with her recollections of childhood, the trials of girlhood and the jealous mistress. She continues with observations on the fear of insurrection, the church and slavery and continued persecutions among many others. Her last chapter is "Free at Last." "But I now entered on my fifteenth year - a sad epoch in the life of a slave girl. My master began to whisper foul words in my ear. Young as I was, I could not remain ignorant of their import." "August 27, 1861...I hate slavery. I hate a man who - You say there are no more fallen women on a plantation than in London in proportion to numbers. But what do you say to this - to a magnate who runs a hideous black harem, with its consequences, under the same roof with his lovely white wife and his beautiful and accomplished daughters? He holds his head high and poses as the model of all human virtues to these poor women whom God and the laws have given him. From the height of his awful majesty he scolds and thunders at them as if he never did wrong in his life. Fancy such a man finding his daughter reading Don Juan. 'You with that immoral book!' he would say, and then he would order her out of his sight. You see Mrs. Stowe did not hit the sorest spot. She makes Legree a bachelor." Keep in mind if you read the online edition of Mrs. Chesnut's diary that it is an edited version published in 1905 which is subject to several deletions by the editors of that day. Fortunately, they left the preceding paragraph intact. The 1905 edition contained about 150,000 words while the manuscript copy of the complete diary contains closer to 400,000 words. Some of the 1905 deletions might have been to avoid offending persons then living. However, some of Mrs. Chesnut's frank views of slavery were also excluded from the 1905 edition and have since been included in versions published in the last quarter of the 20th century. The copy that I have on my shelf was edited by Ben Ames Williams and originally published in 1980. As genealogists, we seek to understand the trials and travails of our ancestors. These two books are crucial to an understanding of our shared American family history. The family historian must have historical context when evaluating historical records of genealogical value such as the U.S. census. For example, I am currently working with a client whose family has historically identified as white but has oral history about African ancestry. We have been able to find several records that substantiate the stories of African ancestry. In addition, DNA analysis has also confirmed the African ancestry. The research has lead us to a mulatto woman, named Evaline Brenham, in the 1880 census of Catahoula Parish, Louisiana. She was also found in the 1870 census in the same parish but she was listed as white. The head of household in both of these censuses is a white man named George H. Richardson. The theory is that George Richardson may be the father of Evaline Brenham. In 1860, we find Mr. Richardson in Concordia Parish working as an overseer and listed between two major landowners, Farrar B. Conner and Henry Chotard. The goal is to find the mother of Evaline Brenham and to connect George H. Richardson as an employee of one these major landowners. The next step in this research project will be to begin reviewing microfilm from the Records of Ante-Bellum Southern Plantations that are available at many university and public libraries. We will begin with the records of the Conner and McMurran families that owned the Killarney plantation in Concordia Parish, Louisiana. The collection includes many business records and letters related to the operation of the Killarney plantation and many others in the Natchez district. Many of these letters were written by women. The early life of Evaline Brenham and the name of her mother is currently shrouded in mystery. We may never know their precise identity, but reading books and letters such as those described above will give us a better idea what life was like for their contemporaries.